This research paper argues that pottery existed as a type of social media in Indigenous North American societies, and uses pottery shards to analyze the social connections between communities. The author, Jacob Lulewicz, explains how he used “changes to both the tempering agents—aplastic materials such as sand, limestone, or crushed shell used to strengthen the ceramic product—added to clays in the production process, as well as changes to the highly visible modes of decoration that adorned the exteriors of ceramic pots” to track how information was spread throughout the Appalachians before European colonists arrived. By analyzing these aspects of pottery, researchers could determine how personal these connections were, as certain methods would have needed close, face-to-face contact, whereas things like decoration could be copied. In the end, Lulewicz determined that networks of kin and clan were much stronger than previously thought, and that the Etowah community was the largest and most important community because it served as a bridge between Georgia and Tennesse. 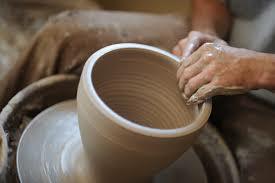 In “Making Pottery”, author Bill Barnett claims that there are only three major steps in creating a pot. The first step is to collect the clay by mining clay deposits, and then to mix the clay in a process called tempering. Tempering clay involves adding additional materials to the clay, such as sand, grass, or ashes, to improve the quality of the pottery. The next step is to form a pot from a lump of clay. This can be done in a variety of ways, including coiling, paddle and anvil, slab construction, molds, and the potter’s wheel. Each of these methods are very different and create a variety of different kinds of pots. Barnett explains that “once a vessel is formed, it must be thoroughly dried, or water in the clay will escape too fast during firing and crack the pot.” When firing pottery, it is important to control both the temperature and the environment. The higher the temperature, the more the clay will fuse together, and the amount of oxygen can affect the color of the ceramics. This Ceramics Monthly article profiles Elena Renker, a studio potter from New Zealand. The article examines her work and comments that “her particular fascination with the loosely formed, free-spirited teabowl comes out of a few key events in her life as a potter: the influence of her teacher, her direct experience with wood firing, advance studies of shino glazing, and her participation in a Korean teabowl festival.” She studied under Len Castle for four years to gain a better understanding of Japanese Shino glazes and in 2015 Renker studied at the Shigaraki Ceramic Cultural Park in Japan for a month. When she was setting up her home studio, she found that it made sense to have a wood fire kiln, and build one from scratch with the help of Peter Lang. Renker produces beautiful works with her unique style of many different techniques, like faceted, organic shapes with unpredictable glazes and firing processes.